At the end of 2016, I had a chance to visit the town of Hirono in Iwate Prefecture (岩手県、洋野町) in the northeast of Japan. It is a small town, off the beaten track. 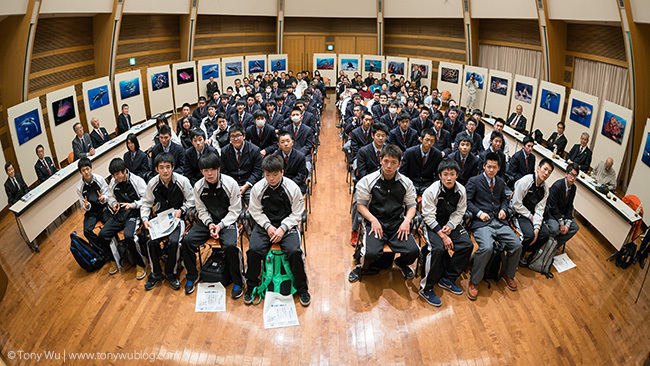 I probably would not have had cause to visit if not for the kids of Taneichi High School (種市高校), pictured below looking absolutely thrilled to have their photo taken. In addition to offering tuition in normal academic subjects, the school provides training for students interested in commercial diving. There is a pool with a maximum depth of 10m, for instance, where the students can learn how to use diving gear for serious submerged work. Cool, huh? The Japan Diving Association (日本潜水協会) supports Taneichi, and my visit was timed to coincide with a substantial donation to the school. 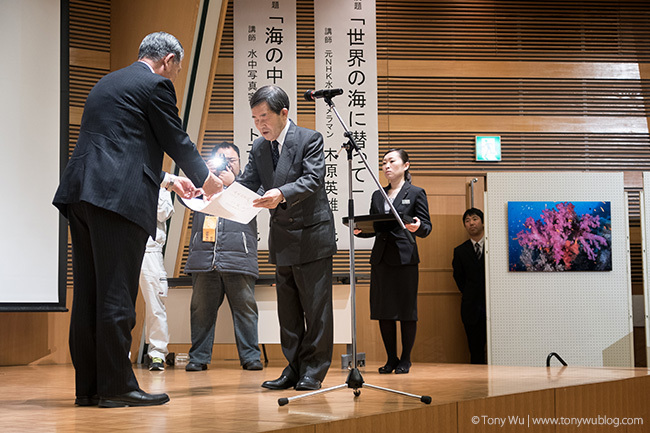 Thirty of my photos were on display, and I had an hour to talk (in Japanese!) about some of the things I've seen and experienced in the ocean. The Mayor and other city officials were in attendance, and at the end of the day, my photos were moved to a larger facility for public display. On a personal note, I was happy to share speaking time with my friend Mr K., a man I trust and look up to (related Post 1, Post 2). 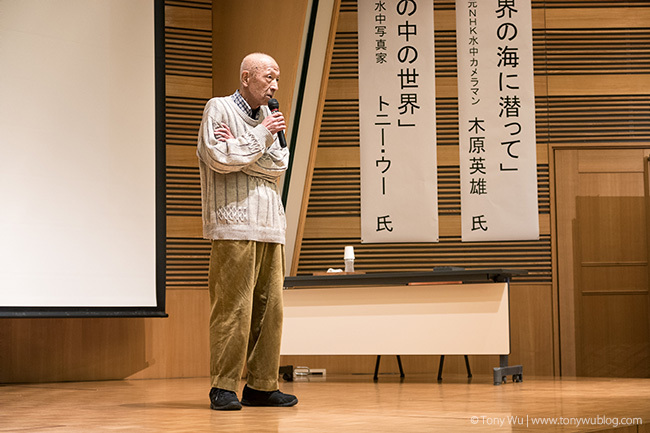 He has been living with cancer for nearly two years at this point, so one could be forgiven for assuming that he had more pressing matters than traveling to northeast Japan to face a group of high school kids. But Mr. K., who has had a long, productive career in underwater video, felt it important to share his experiences and thoughts with the next generation. I have nothing but admiration for the strength of his spirit and his ability to think of others. One of my New Year resolutions is to be more like my friend. I will be giving a talk to a big group of little kids in Japan later this month, and I plan on doing more of the same as often as I can.